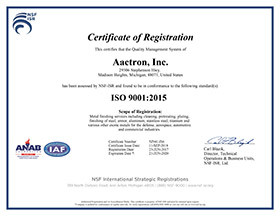 Aactron has been supplying the Defense industry since the 1960’s and we are well-versed in testing & documentation requirements and routinely obtains process approvals saving customers time and expense. Aactron boasts an extensive library of specifications and decades of experience dealing with military contract requirements for the United States and countries in Europe, Asia and the Middle East. We offer all cleaning, pretreatements and finishes for steel, armor, aluminum, stainless steel and other alloys.